Operator of the PNG LNG Project Exxon-Mobil PNG Limited is continuing to manage the impacts to its facilities following Monday's 7 point 5 magnitude earthquakes. The company, in a statement said, the two LNG trains at the plant near Port Moresby have been safely shutdown following the closure of the Hides Gas Conditioning Plant, and Hides well pads in Hela Province. Exxon-Mobil Managing Director Andrew Barry said, they are also continuing to work with their customers to minimize the impact, while non-essential personnel from the Hides Conditioning Plant are continuing. The company has also flown its specialist engineers into Hides to join remaining personnel on site to assist with damage and repair assessments. 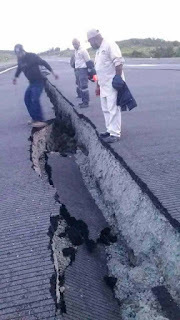 A full assessment on the impact of earthquake on the Company’s Highlands facilities including roads and other infrastructure is expected to be done later. Mr. Barry said, the Komo Airfield has also sustained damage and will remain closed until further notice, while communication continues to be one of the most significant challenges. He also said that they are working closely with the National Disaster Center, Aid Agencies and their partners, to ensure all information is shared and relief plans are coordinated properly. Meantime, Oil Search Limited said number of their 20-plus campsites have been damaged. Managing Director, Peter Botten, however said all their staff have been accounted with no serious injuries so far. “To ensure the ongoing safety and welfare of the staff, the company has evacuated entire non-essential staff to Port Moresby”. Mr. Botten said they are currently assessing their wells, gathering systems, production facilities and other infrastructure to establish whether there has been any material damage. He adds they will continue to work closely with the PNG LNG Project operator in coordinating these activities where appropriate. Photo: KOMO INTERNATIONAL AIRPORT split in half caused by the 7.5 magnitude earthquake in the early hours of Monday ( 26 February 2018). The epicentre of the earthquake according to the USA geological survey is near Komo in the Southern Highlands of Papua New Guinea.